Lock in a great price for Balhambra Suites - Adults Only – rated 9.4 by recent guests! The hotel was nice and clean, very friendly staff. Central location, no issues with noise. Plenty of space and relaxed. Thermal comfort good although we had the air-conditioning on a fair amount of time. Friendly. Great bed. Very central to Fiskardo Port. Very clean rooms and well equipped. Very friendly staff. Very efficient. Just returned from a very enjoyable stay at the Balhambra Suites. The apartments are finished to an excellent standard,are beautifully furnished and kept spotlessly clean. 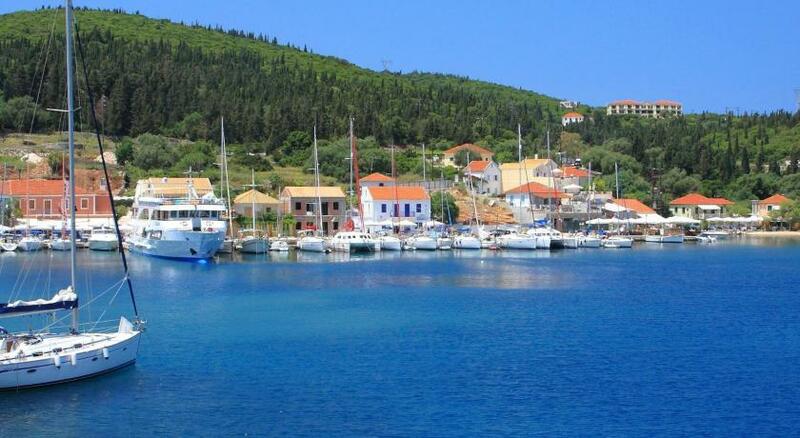 The location is very central to Fiskardo but unbelievably peaceful, quiet and relaxing. Angelo, the proprietor was always very helpful and personable. Look forward to returning! Very comfy beds and extremely quiet location, even though it is situated in the centre of Fiscardo village. Milu and her brothers were very friendly and really helpful. A great location for shops, restaurants with a supermarket not far away for your supplies if you choose to stay in. I recommend this place to stay for your holiday. The location is perfect with stunning view. 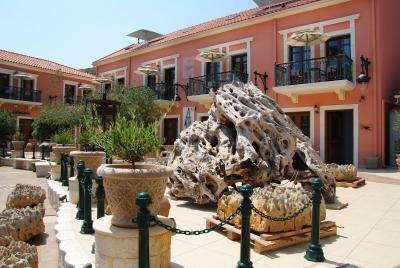 Rooms are located in the heart of Fiskardo so everything is really close. The decoration is beautiful with great details. We really enjoyed the location: next to the restaurants and harbor and yet calm and quiet. Unexpected peaceful night after lively evenings at the bars or restaurants. Very spacious room, cosy balcony overlooking a lovely and quiet fountain. The hearty welcome of Angelos, our luxurious and spacious bedroom with balcony and lovely view, the proximity to the lively and beautiful Fiskardo harbour ... all this was a perfect recipe for a wonderful holiday. Although we had a fully fitted kitchenette, a delicious breakfast was served with a friendly smile every morning. Bicycles were available to rent on site and we could visit the nearby beaches and enjoy spectacular views. The central location added to the ease in which we could explore, return to our room to relax, change and have lunch overlooking the harbour - all in one morning! Thank you Angelos and all the staff for an unforgettable, jam-packed holiday in Fiskardo. What a gem - we highly recommend Balhambra Suites!! The boutique-style Balhambra Suites is centrally located in Fiskardo surrounded by olive trees and lavender bushes, featuring a charming courtyard with a fountain. It offers self-catering suites with colonial decor and furnished balconies. Balhambra suites are uniquely decorated featuring elegant, dark-colored wooden furniture. They enjoy harbor or courtyard views and they all have a living area. Facilities include a flat-screen satellite TV, DVD player and free toiletries. Some are also equipped with a coffee machine. Right next to the complex, there is a café and a super market, where you can buy your daily essentials. The nearest beach is at 328 feet, while the free public parking can be found at 250 feet. Free WiFi is provided throughout. When would you like to stay at Balhambra Suites - Adults Only? Partially overlooking the harbor from its furnished balcony, this colonial-style suite enjoys free Wi-Fi and includes a kitchenette, a living area, a flat-screen satellite TV and a DVD player. Guests will find free toiletries in the bathroom. Spacious, colonial-style suite with partial views of the harbor from its furnished balcony. It enjoys free Wi-Fi and includes a kitchenette, a living area, a flat-screen satellite TV and a DVD player. Colonial-style suite with a furnished balcony overlooking the courtyard. It enjoys free Wi-Fi and includes a kitchenette, a living area, a flat-screen satellite TV and DVD player. Spacious, colonial-style suite with a furnished balcony overlooking the courtyard. It enjoys free Wi-Fi and includes: a kitchenette, a living area, a flat-screen satellite TV and a DVD player. Guests will find free toiletries. Offering partial views over the harbor from its furnished balcony, this air-conditioned suite is fitted with a loft. It features a living room with flat-screen, satellite TV and a kitchenette with mini fridge. Free WiFi is provided. Offering partial views over the harbor from its spacious, furnished balcony, this air-conditioned suite comes with a separate bedroom. It features a living room with flat-screen, satellite TV and a kitchenette with mini fridge. Free WiFi is provided. Small, boutique accommodation that is centrally located in Fiscardo on the village square, with all amenities, restaurants, bars, and waterfront on the property's doorstep. Beaches are within walking distance, and a short 5 min drive by car. House Rules Balhambra Suites - Adults Only takes special requests – add in the next step! Balhambra Suites - Adults Only accepts these cards and reserves the right to temporarily hold an amount prior to arrival. Please note that all suites come with a double bed and therefore single beds are not available. We had a roof apartment so the balcony was tight and you didn't get much of a view if you sat down. Directions from the car park helpful- still wasn't that easy. There was nothing to dislike, just perfect. Cannot fault the Balhambra Suites. There wasn't anything which I could say that I didn't like, apart from I couldn't get to the tv to work. However, this didn't bother me as I do not go on holiday to watch TV and I am sure if I told one of the owners it would have been sorted out. Taking into consideration the price and the overall picture, i expected different recomendation for breakfast. Breakfast is not included in the price ( and its ok-we knew it)but they recommend a place really close to suites. It costs 10€ BUT it was horrible. I do not mind to have variety but what about quality??? Another thing that really suprised me was the lack of hostility. An example is that the reception ( during the workinh hours)was closed when we checked out. The lights in the room, especially the bathroom are too dark. The shower in the bathroom doesn’t have enough water pressure, so taking a shower was not really comfortable. The breakfast is at a bar next to the hotel, the staff there is really friendly, but the breakfast is only basic, lot of room for improvement. Parking a little closer would have been nice especially lugging our suitcases around, but the Owner Angelo is hoping to add parking in the rear of the complex. A rear balcony would have been good to follow the sun around the building and also somewhere to dry clothes without spoiling the ambience of the court yard. Location was fantastic right in the heart of the village/harbour and the rooms were well appointed and we especially loved the private balcony of our loft apartment. The Owner and all the Staff were lovely and added to the ambience of our Holiday/Honeymoon memories. Luxury apartment room 111. Wonderfully spacious with an enormous balcony overlooking the town and harbour. The owner Angelos is a great guy and always makes you welcome. Wouldn’t stay anywhere else in Fiskardo.